The Cover: Gorgeous! Black, White, Pink, and Green - my favorite colors! I know I complain about all the stories that have girls with pretty dresses on them, but it really works here! This is a fairy tale book- and fairy tale books need fancy dresses and roses! This cover is perfection! The Characters: I loved that the characters names were days of the week and that there was so much magic involved with the characters. I loved that every single character had a magical trait that set them apart. With so many characters involved in the story, it could easily have gotten confusing. The author did a wonderful job giving each character life and a personality and magical traits that set them apart. Sunday is a character that the reader can relate to. She is a classic fairy tale hero: loving, kind, brave, and a little bit cynical. Rumbold is every inch a dashing prince, with skeletons in his closet that have given him some self-esteem issues. I think it is hilarious that the author touched on... what is life REALLY like after you have lived as a frog? The Story: This story fits in well with other authors like Gail Carson Levine, Shannon Hale, and Juliette Marrillier. It reads like a classic fairy tale- love intrigue, mystery, and action. The plot was full of twists and turns that kept the reader engaged and interested in the story. I can't WAIT to see this book as a movie- it is a book that would make a FABULOUS movie! This is a book that I am certain will do very well when it is released. If you have not yet pre-ordered Enchanted, I highly recommend that you do- you will not regret buying this one! I think this book looks like it's going to be super cute! I'm glad you enjoyed it so much, and now I can't wait to read it! Sounds like an adorable story! Eee! Lovely review. I really want this one. It sounds so ridiculously sweet and adorable. And that cover is gorgeous. 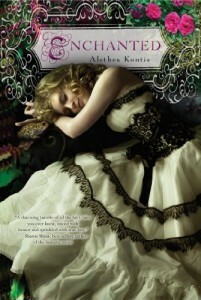 Juliet Marrrillier is such an amazing author, so if Alethea Kontis is being compared to her I am in. Well, more in than I already was, which was pretty in! And if that cover doesn't just make everyone who sees it want to bring it home, then I think there may be some crazy people out there. Just kidding, no offense to anybody, promise! In my opinion it is just too pretty. I cannot wait to read Enchanted! Thanks for your great review!